Franklin & Harpe perform 1920s and 1930s blues and ragtime in the Piedmont, Memphis and St. Louis guitar-duet style. This is the second release by Rick Franklin and Neil Harpe, both on guitar and vocals. 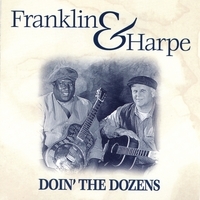 Franklin & Harpe perform 1920s and 1930s blues and ragtime in the Piedmont, Memphis, and St. Louis guitar-duet style. The group has performed and continues to perform throughout the Washington DC metropolitan area at events such as the Washington Folk Festival, Northern Virginia Folk Festival, the DC Blues Society Blues Festival, and the Baltimore Blues Society, in addition to appearances at The National Portrait Gallery and various clubs and cafes. Rick brings the wonder of BLUES back to me! Hey, Hollywood! We've listened to the soundtrack, now give us the movie! Listen to this and you will feel yourself at the margin of the Mississipi, surrounded by the atmosphere of the Twenties. Those guys managed to join voices, guitars and mood to bring back one of the sharpest musical images ever created over the Delta melodies in this so-called modern era. Now we just have to wait that Hollywood come up with the movie - the perfect soundtrack is already available in this album. God bless you, guys! Cheers from Brazil!